Karl, aged seventeen, is hopelessly in love. But the object of his affections, Firella, demands proof, and poses him a series of questions regarding his attitude to the many sides of love. But Karl is dyslexic, and convinced that if Firella finds out, she will think he is stupid, and unworthy of her, and leave him. So Karl asks a local writer to help him construct his replies – and an unlikely, but extremely touching, friendship develops between the two men. They both come to learn a great deal about about life from a very different perspective, and when an act of violence shatters their calm, they find their respective appraisal of life shifting in profound ways. This is the kind of book that makes me wonder why no one’s written something like this before. It seems so… and this is going to sound horrible and negative but let me assure you I don’t mean it in that way… obvious. Let me explain quickly, because I imagine someone describing my writing as “obvious” would lead me to throw my laptop out of the window and the refusal to write again. I first heard about this book from Patrick Ness’ review on The Guardian. I don’t tend to read reviews in newspapers because I always prefer one of my best friends to recommend books rather than someone I’ve never heard of who doesn’t know my reading tastes. Does that make sense? Anyway, not that I’m saying Patrick Ness is my best friend (one day…one day), but there was something about his review that made me really interested in this story. And this is where I come back to the ‘obvious’ comment. Basically, this book is about a seventeen year old boy called Karl who is in love with a girl who asks him to write letters to her. But Karl is dyslexic and doesn’t feel that he could put his thoughts into words so, instead, he gets in contact with Fiorella’s favourite author and asks for help. Now, if you didn’t know anything about this book, you’d be forgiven for thinking that it would be told from Karl’s perspective. But actually, it’s told from the perspective of the elderly (unnamed) author. So choosing to write a YA book told from the perspective of a seventy-something year old man seems like the best way to write the most authentic teenage book. You’ve got the benefit of hindsight. You’re removed from the problems and the drama and can provide a fresh perspective. And, most importantly, it takes out the murky feelings you get when you’re a teenager and you’re trying to sort through all your confusing, twisted emotions, when everything is amplified. And also, it takes away the risk of sounding like a tragic writer who is pretending to be ‘down with the kids’ and LOLZ and totesamazeballs. And this is what I’m trying to get at by saying that this book seems obvious because it’s so obvious that I can’t believe other authors chosen to write a YA book from a perspective of an adult. When I’m writing reviews, I don’t tend to look at other people’s thoughts on the book. But while I’m writing this, I was curious to see what other people thought of it and I’m quite surprised at the “meh” feelings that a lot of people had about it. Whereas this book may not be the most exciting and riveting book in the world, it’s extremely poignant and, without sounding extremely cheesy and ridiculous, really spoke to me. You know when you’re reading a book and you underline pretty much everything? This book is like that. To me, this book is all about the process behind the creative process, something that is extremely important and fascinating to me. Whether you create by writing stories, painting sprawling murals, drafting stanzas on Word, sketching on the back of bus tickets or manipulating metal to make sculptures; this book explores the idea of finding your own way of expressing your own creativity, regardless of whether you’re academic or whether you scrape(d) by at school. And it’s all about the self-doubt you have with your creativity and the seemingly endless struggle. But then, of course, it’s about the feeling of accomplishment when you’ve done it, and you’ve beaten the odds, and even if no one sees it or even if no one likes it, it doesn’t matter because you’ve done it. So, in that sense, as you can imagine, I loved this book. And I know I’ll revisit the many, many passages that I highlighted. That’s not to say I didn’t have some problems with this book. It is very dense and extremely dialogue-heavy, so if you’re looking for fancy pants metaphors and description then this book isn’t for you. And there actually isn’t much in way of a story, which normally wouldn’t bother me too much, but it just meant you really had to be concentrating. 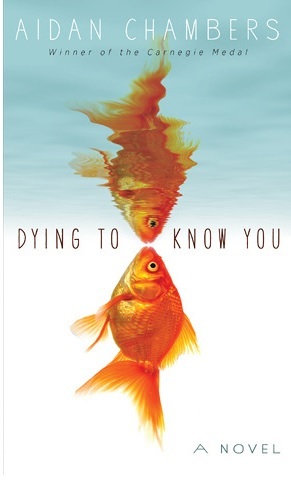 Dying to Know You isn’t an easy book to recommend because I know a lot of you won’t be too fussed about it. But to me, and hopefully at least a few of you, it’ll be one of the more interesting and unique YA books I’ll read this year. Ps. This isn’t technically my review but I wanted to share another passage I highlighted because it’s pretty much the best description of a teenage girl I’ve come across. And I should know because I went to school with about 200 of them. Oh and yeah, I was one. Aidan Chambers is one of my all-time favourite authors so I’m always excited to see others enjoy his work. (: Loved the quote at the end of the review — for an 80+ year old man, Chambers is *amazing* at getting inside the mind of teenagers, both male and female. Thanks Michelle! I’ve had Postcards from No Man’s Land on my shelf for so long but I’ve just not gotten around to reading it yet. This has definitely encouraged me to read it sooner rather than later! Wow, this sounds brilliant Jo! And I totally know what you mean about books that just speak to you.. sometimes it’s like coming down with a thud when you check out other opinions and you realise that not everyone feels the same way. But seriously, this sounds wonderful and I must add it to my TBR! Ooh, this book sounds brilliant! Thanks for the lovely review, I’ve just bought it on bookdepository (this speaks such wonders for my self control). By the way, my friend and I are starting a Patrick Ness goodreads group, and we named it Nessochism. Is that okay with you, since you coined the term?